NEW APARTMENT comfortable and well-stocked to the Lido. Located in the building of new construction, it consists of large living area with kitchenette and sofa bed, double bedroom, another bedroom with three beds, large bathroom with shower and utility room; the property includes a small terrace with table and chairs for dining al fresco and enjoy moments of relaxation. The apartment is equipped with every comfort, included: flat screen TV, air conditioning, microwave, dishwasher, washing machine, videophone, iron; very close to all major services. The Lido beach and the seafront promenade are within walking distance. Adjacent, identical apartment available for additional 7 beds. 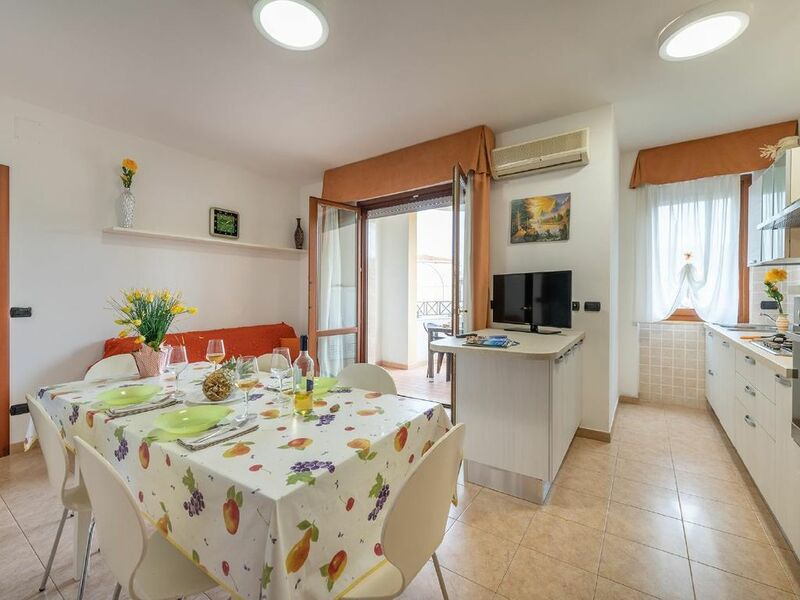 The rates indicated refer to a maximum occupancy of 5 people; for higher occupations: 10 euros per person per day.Consumption of water, light and gas: included in the rental price.Kitchenette and dishes to be left in order and clean; otherwise a surcharge of € 50.00 will be charged. Linen rental upon prior notice: 20,00 € per person.Late check in, on request (for arrivals after 20.00): 50.00 €; late check out (after 10 am): charge of an additional night stay. Animals are not allowed. Tourist tax to be paid locally: for people over the age of 12 and for a maximum of 7 consecutive nights 0,50 euro per person per day from 1 May to 30/09; € 0.25 in other periods. Security deposit: 200,00 €. The customer will be responsible for collecting the waste separately and disposing according to the collection table; the accommodation at its return will have to be unpacked from all waste, in default will be retained 50% of the security deposit. The indicated rates refer to a maximum occupancy of 5 persons; for higher occupations: 10 euros per person per day. Internet: per object and day Costs amounting to 9 EUR (optional). Visitor's tax: per object and day Costs amounting to 0.25 EUR (Mandatory). Final cleaning: per object and week Costs amounting to 75 EUR (Mandatory). Towels: per person and week for rent at a price of 10 EUR (optional). Bed linen: per person and week for rent at a price of 10 EUR (optional). (Per property and week, to be brought by the traveller 50 EUR). Bed linen (per person and week, according to consumption 10 EUR). Parking facilities (per property and day, included in price 0 EUR). Towels (per person and week, according to consumption 10 EUR).